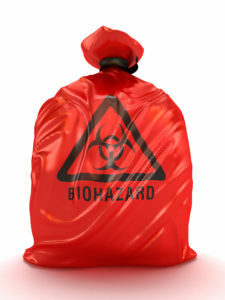 Medical Waste Packaging: Do You Know How to Tie a Red Bag? What are some of the improper ways that facilities can be caught red-handed when it comes to medical waste packaging? Medical waste packaging and labeling is the responsibility of the waste-generating facility itself. Packaging includes sharps containers, biohazard containers, red bags, and reusable containers. Failure to comply with safe containment is not only an environmental issue, but a community health issue that can come with hefty fines. What are some of the improper ways facilities can be caught red-handed when it comes to medical waste packaging? Do you know how to tie a red bag? You can’t just tie a red bag up like a bow and call it a day. Red bags must be securely closed to prevent the contents from escaping. If you can hold it upside down and it doesn’t leak, then you’ve done it correctly. To tie a red bag, use an overhand knot, a zip tie, or a twist tie. Seal the red bag with a minimum of entrapped air. Don’t overfill that sharps container! As with any package, one must not overfill! The FDA recommends facilities fill sharps containers only ¾ full to prevent injury. Overflowing sharps containers put healthcare workers at risk because they can accidentally get stuck with a needle from an unknown source. There are specific federal markings required for hazardous waste, including the biohazard symbol, “this-side-up” arrows, signs that dictate regulated medical waste, all of which must be present and clearly visible. There are also state regulations on properly labeling as well. Improperly labeling containers poses a risk to staff, patients, and the community, and can result in penalties and fines for non-compliance. Medical waste cannot share receptacles! Common sense tells us that sharps do not belong in a regular trash receptacle, but you’d be surprised that there are still facilities whose staff improperly dispose of infectious waste. 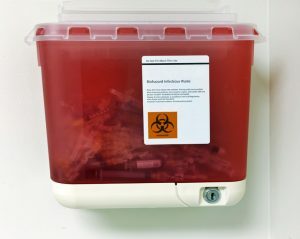 Sharps go in a sharps container, whereas red bag waste should contain anything that is infectious biological material, including blood and blood products, cultures, and culture stocks. The higher risk a type of infectious waste poses to human, the higher standard of container you need. Failure to comply with government regulations as they pertains to medical waste disposal can be a confusing and costly experience. Let Red Bags take the guesswork out of it for you.